"Dis iz a terrific gumbo recipe, if'n you close your eyes, you'll swear Mama is makin'it fer ya. Feel free to substitute crawdads fer de shrimp. File is optional and is always added off of the heat. 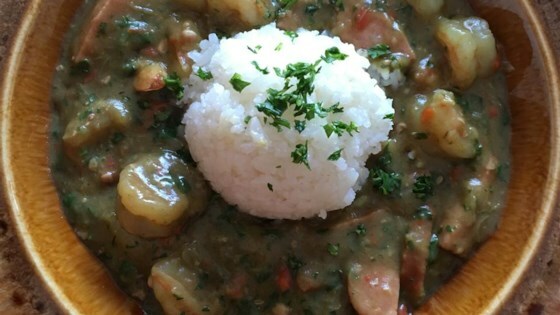 Add rice to the center of a large soup bowl, add gumbo. Deeelicious!!!" Melt the butter in a large skillet over medium heat. Add the garlic, onion, bell pepper, celery and okra; cook and stir until golden brown. Remove from the skillet, and set aside. Brown the sausage in the skillet over medium heat. Remove from the pan to drain on paper towels. Drain the sausage fat from the skillet, and pour in the vegetable oil to heat. Place the chicken in the skillet, and cook for about 20 minutes, turning frequently. Remove chicken from the pan, and place on paper towels to drain, leaving the oil in the pan. Reduce the heat to low, and stir in the flour. Cook, stirring constantly, until the roux reaches a deep brown color. This should take about 30 minutes. Stir 2 cups of water into the roux, and add the onion, garlic and peppers. Set the heat to medium, and bring to a boil. Stir in the chicken broth, and simmer over low heat. Cut the chicken into cubes, and add to the broth along with the sausage. Simmer for about 1 hour. Meanwhile, combine rice and 2 cups of water in a saucepan. Bring to a boil, then reduce heat to low, and simmer for 20 minutes, or until rice is tender. Add the shrimp to the gumbo, and season with thyme, parsley, salt, cayenne pepper, and hot pepper sauce. Cook for another 20 minutes. Remove from the heat, and stir in the file powder. 6th line down: 1 lb okra... This is the real deal. It takes for-freakin'-ever to make, but it's worth it. Make a double batch if you've got a pot big enough. It won't last. YUMMMM! Instead of the spices, I added three tablespoons Zatarain's creole seasoning. Gave it just enough spice. It turned out fabulous! Definetly will make again. This recipe was a nightmare for me. There wasn't enough fat to make the roux. I'm not experienced in making roux so my improvisation didn't work well either. This recipe was great. Everyone raved. My kids keep coming back for more! I added crab meat as well. Will definitely make again. Awesome! This was wonderful. I saved some time by using a premade roux. It was so easy to make and delisious. I will make many more times. I have never seen a light colored gumbo before, but this was one of the best I have ever made. I added crabmeat for taste.